The Greeter's Corner has a great location right next to Main Beach. This is a very casual restaurant with a patio in back which provides great street level viewing of the grassy areas of Main Beach! This diner-style restaurant is named after Eiler Larsen who spent over 30 years spreading goodwill on this streetcorner in Laguna Beach. Nicknamed "the Greeter", Larsen would wave and say hello to anyone passing by! 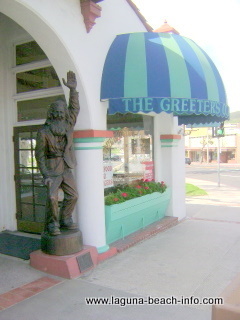 Now a statue honors his dedication to the city of Laguna Beach in front of this restaurant. This restaurant is very popular with tourists due to its convenient location. The food is good, but if you are really looking for fantastic cuisine, there are some incredible Laguna Beach restaurants to choose from!